When uninterruptible power supplies (UPS) were developed for the oil and emerging computer industries in the 1950s their primary purpose was to both provide ‘uninterruptible power’ and condition the mains power supply. Early computer power supplies where less reliable than they are today, with a smaller input voltage and frequency window and were susceptible to power pollution – sags, surges, brownouts, spikes, transients and electrical noise. The power supplies within your servers are today far more robust. Whilst server power supplies undoubtedly benefit from a UPS conditioned supply (reduced ‘wear and tear’), the purpose of a UPS in most modern data centres and comms rooms is to provide a source of uninterruptible power. Today the modern UPS system can be thought of more as an energy storage device. With Smart Grids on the horizon and tariffs for on-site generation (solar PV and Demand Response generator programs), it can only be a matter of time before uninterruptible power supplies start to generate income for their owners. Or is it? Driven by the datacentre world, UPS manufacturers have focused on energy efficiency, compactness and modularity. Little development has gone into the primary ‘energy storage’ component within UPS systems; namely the battery set. Today’s UPS dominant battery technology is the VRLA – valve regulated lead-acid battery. Normally sealed and maintenance free, UPS battery technology is not far removed from that of a standard car battery. Lead-acid technology is ideal for periodic cyclic charge/discharge cycles i.e. non-continuous use. Sure a UPS battery will provide a runtime and from minutes to several hours but the point is that the discharges (to cover mains power cuts) are fairly infrequent. Whilst Nickel-Cadmium batteries fell foul of environmental changes (and wisely so), they did offer some benefits in terms of their capacity and charge/discharge cycle capabilities. The only alternative battery technology now for applications that require rapid recharges and frequent discharge is the Lithium-ion one frequently found in our smart mobile phones, tablets and laptops and for those pioneering few their electric vehicles. For a UPS system to perform as a true energy storage system it must be capable of using Lithium-ion technology and there is the rub. Car manufacturers such as BMW, Tesla and Toyota are harnessing lithium-ion technology for their electric vehicles but few UPS manufacturers have launched lithium-ion enabled back-up systems. Yet, Lithium-ion provides several advantages over traditional VRLA batteries. Firstly, this battery technology is more suited to the rapid and frequent charge/discharge cycles required for energy storage. The downside being the complexity of the charging system required to balance and optimise, the charging current across the battery set to prevent thermal runaway. Whilst the charging and monitoring system is more complex for a Lithium-ion battery, a benefit can be more accurate battery and runtime capacity information. Lithium-ion batteries are more compact than an equivalent Ah-rated lead-acid battery set, with potential footprint and volume reductions of about 60%. Weight may also be reduced by a similar factor leading to less physical space requirements within a datacentre plant room or white space server rack. Lithium-ion batteries are more temperature tolerant than lead-acid batteries. Lead-acid requires an operating ambient of 20-25°C and for every 10% ambient temperature increase above 30°C the design life can halve. Lithium-ion batteries are less susceptible to temperature variation. This has implications on cooling within datacentres and where a UPS and its battery can be placed. This may become more important as the ASHRAE standard pushes up white space operating temperatures, in a bid to reduce cooling energy consumption. 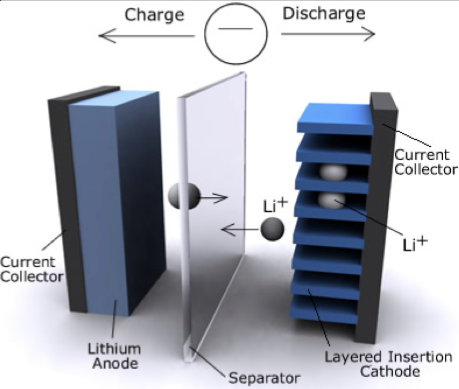 Lithium-ion batteries may also be more predictable in terms of working life. For lead-acid batteries the problem has always been one of how to measure the ‘health’ of an individual battery block. Battery testing technologies are developing and conductance battery testing is considered to be superior to the traditional impedance testing variety. Whilst impedance testing measures whether a battery has failed, conductance testing measures health and regular testing can help to identify failing cells more accurately. Lithium-ion batteries may prove to be more reliable long-term and less prone to erratic failure, with working lives for a Lithium-ion battery set of 10 years or more as standard. Compare this to the 3-4 and 7-8 year typical working life spans of 5-year and 10-year design life batteries and the economic argument for Lithium-ion batteries becomes even stronger. As with any UPS system and critical power investment, one thing that clients always consider is the Total Cost of Ownership (TCO). Lithium-ion batteries typically carry a 30-40% premium over lead-acid and their capacity range, whilst increasing still limits them in terms of the kVA/kW size of UPS they can be used with. This can be offset against the ‘extra’ time period the batteries should last for over lead-acid leading to fewer battery set replacements. Other potential cost benefits to take into the calculation include reduced cooling if the Lithium-ion UPS is to operate within a higher ambient environment. In summary, lithium-ion UPS systems are here but still require development. They are not mainstream yet but are available for some single and three phase applications. Whether the battery technology will replace lead-acid is very much dependent upon future legislation and ultimately price points. The more sophisticated charging regime required for lithium-ion puts up the cost of the UPS and the battery is itself more expensive. As with other green energy storage technologies such as fuel cells, flywheels and compressed-air, lithium-ion powered UPS systems may only enjoy limited demand and mainly from those organisations that want to install green back-up and energy storage technologies. If you would like to discuss a lithium-ion or lead-acid UPS project please contact us on 0800 210 0088 or visit EcoPowerSupplies.com. We always welcome discussions and especially ‘blue-sky’ projects.